Many students come to school expecting to sit at their desks for hours on end. But the children at Luling Elementary School in St. Charles Parish, Louisiana, where the motto is “expect more … achieve more,” come to school expecting to run and dance alongside their teachers — as they learn and gain greater confidence in their abilities. It all started with two educators at the school, speech therapist Dottie Watson and reading interventionist Dana Dufrene, who would meet up at 5 a.m. most days for a shared morning run. They realized that for their students, this type of physical activity was just not an option. “The kids live between chemical and nuclear plants,” Watson said, according to We Are Teachers. “If you’re poor and live in New Orleans, there are still resources, like recreation centers. If you’re poor in a rural area like we live in, there’s not as much.” Many of the children are from single-parent households, and some have parents who are incarcerated. In many of the families, parents work multiple jobs. All this, Watson said, makes for very limited opportunity for physical activity outside of gym class. The club meets Wednesday afternoons and draws a community of classroom teachers, local police officers, school staffers, and CrossFit instructors who volunteer to run, dance, and lead workouts with the kids, as well as mentor and motivate them. 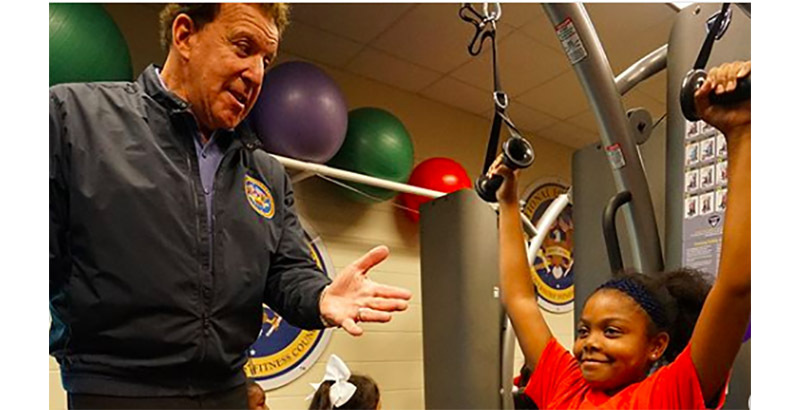 Recognizing LES as a leader in physical fitness, the National Foundation of Governors’ Fitness Councils honored the school as a National Fitness Champion — and paid for a $100,000 fitness center for the students. Many LES kids now race in local competitions hosted by the New York Rising Road Runners — an experience that has shown them there’s nothing they can’t do. “They know they can run a race and do well! Do anything! There are no barriers for them,” said Watson.